This dessert. Oh boy. It has everything going for it. Lush desserts are usually made with a shortbread crust or something similar and topped with fluffy goodness in the form of pudding and whipped topping and often with some sort of fruit. My mom makes a lemon lush that’s to die for but I digress. No lemon here. Pumpkin instead. That’s my idea of a great trade. 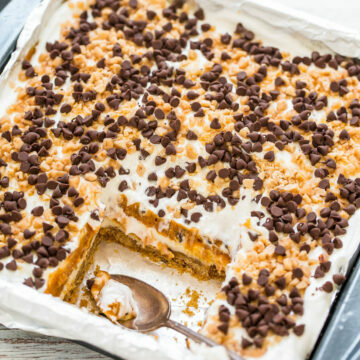 It’s an almost no-bake (the crust bakes for just 10 minutes) layered dessert that begins with a slightly crunchy graham cracker crust, a sweet yet tangy layer of cream cheese, a layer of vanilla pudding that’s spiked with pumpkin, topped with whipped topping, and sprinkled with crunchy toffee bits and chocolate chips. 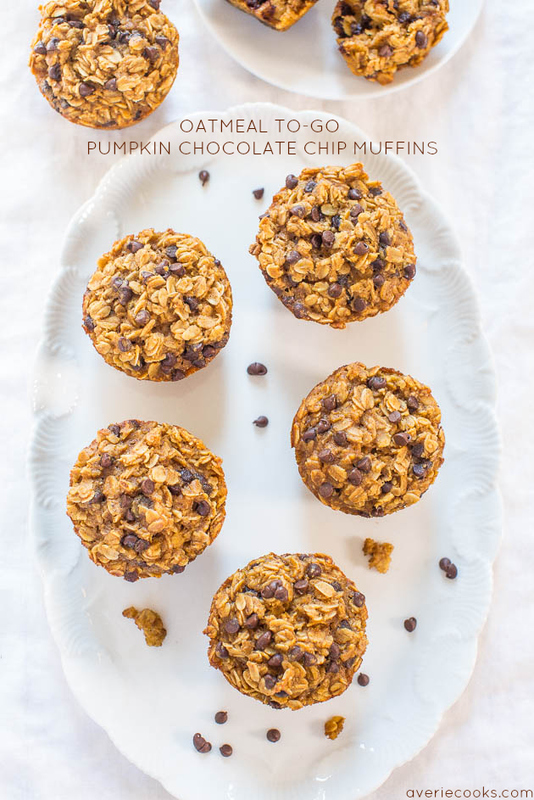 I love the toffee bits and chocolate chips on top for a texture wakeup call. They’re a great contrast to the soft fluffiness below. And I have a thing for graham cracker crusts because they remind me of Seven Layer Bars which also adds a touch of crunch. There’s plenty of pumpkin and pumpkin pie spice for a perfect fall dessert. I used vanilla pudding because I couldn’t find pumpkin pudding. If you can find pumpkin pudding and want to boost the intensity of pumpkin flavor, go for it. This dessert has everything going for it. 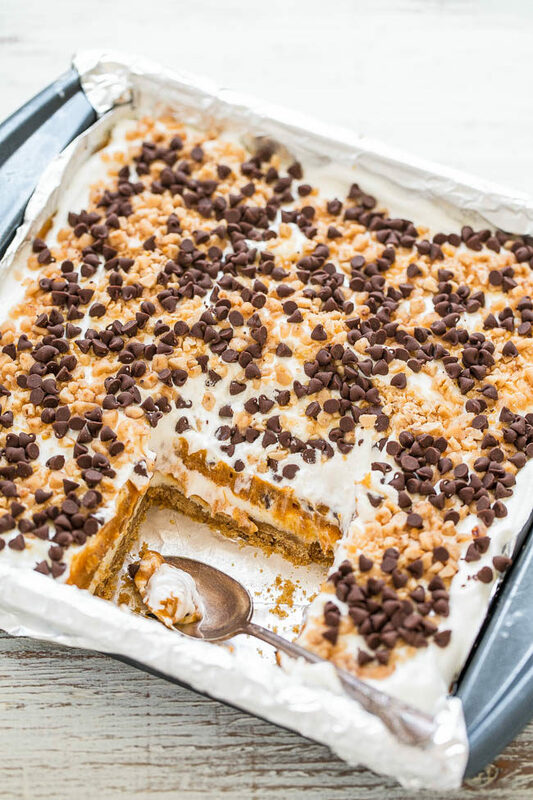 It’s a layered dessert that begins with a slightly crunchy graham cracker crust, a sweet yet tangy layer of cream cheese, a layer of vanilla pudding that’s spiked with pumpkin, topped with whipped topping, and sprinkled with crunchy toffee bits and chocolate chips for texture. There’s plenty of pumpkin flavor for a perfect fall dessert. I used vanilla pudding but pumpkin pudding would be great. Preheat oven to 350F. Line a 9-by-9-inch baking pan with aluminum foil, spray with cooking spray; set aside. Add the graham crackers crumbs and toss lightly with a fork to coat crumbs evenly. Turn mixture out into prepared pan, forming an even, smooth, flat crust layer by tapping crumbs into place with a spatula or your fingertips. Bake for about 10 minutes or until just set; set aside to cool for 10 minutes so you don’t melt the cream cheese in the next step. To a medium bowl, add the cream cheese, confectioners’ sugar, and beat with a handheld electric mixer on medium-high speed until smooth and combined. Turn cream cheese mixture out over graham cracker crust and spread it in an even flat layer using a spatula or knife. Be gentle and careful so you don’t rip the somewhat fragile crust; set aside. To a large bowl, add the pudding mix, milk, and beat with a handheld electric mixer on medium-high speed until thickened, about 3 minutes. Stop to scrape down the sides of the bowl. Add the pumpkin puree, pumpkin pie spice, and beat to incorporate. Add 1/2 cup cup whipped topping and beat to incorporate. Turn pumpkin mixture out over cream cheese layer, using a spatula to smooth it. Evenly spread the remaining 1 1/2 cups whipped topping over the pumpkin layer. Evenly sprinkle the toffee bits, chocolate chips, cover with foil and place in fridge to cool for at least 4 hours (overnight is better) before slicing and serving. Dessert will keep airtight in the fridge for up to 5 days. 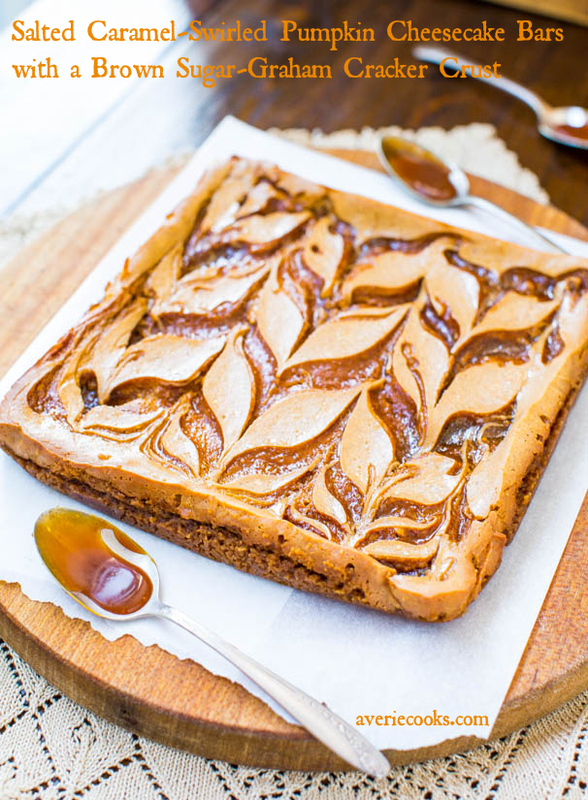 Salted Caramel Swirled-Pumpkin Cheesecake Bars with a Brown Sugar-Graham Cracker Crust – If you like pumpkin cheesecake, you’ll love these rich bars! So much faster and easier than making cheesecake! 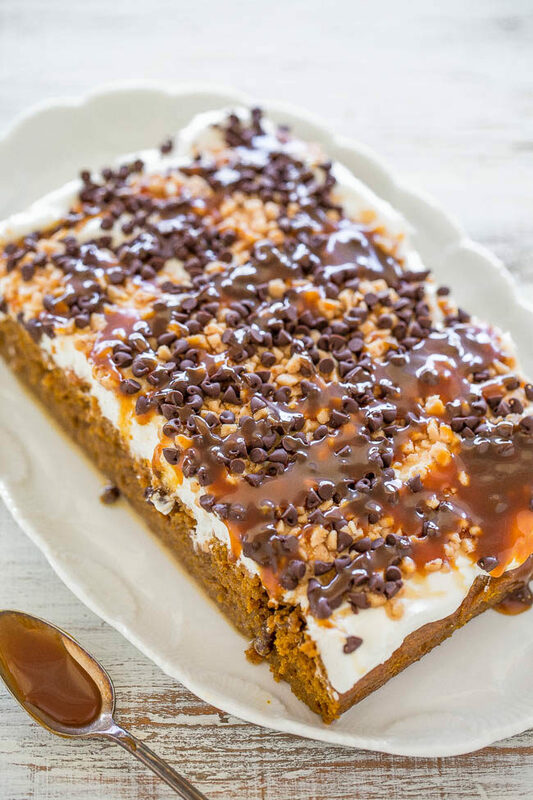 Pumpkin Caramel Poke Cake – Easy and the BEST pumpkin cake ever! 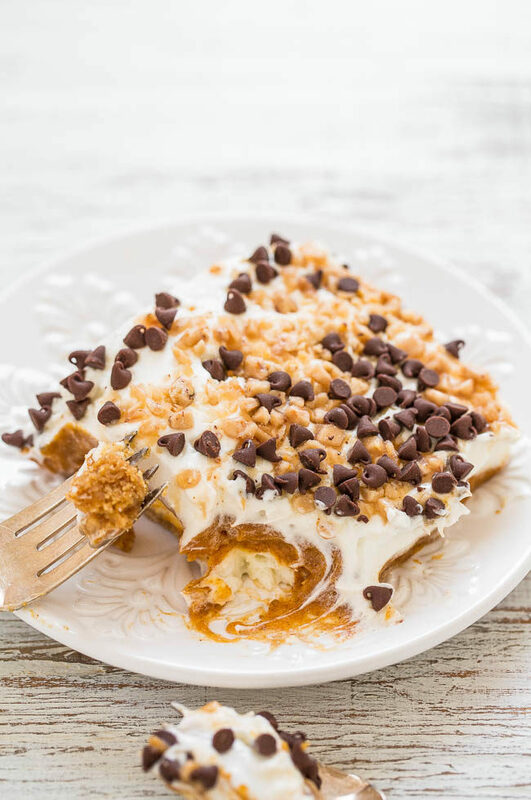 Two kinds of caramel sauce, toffee bits, chocolate chips, whipped topping and more! 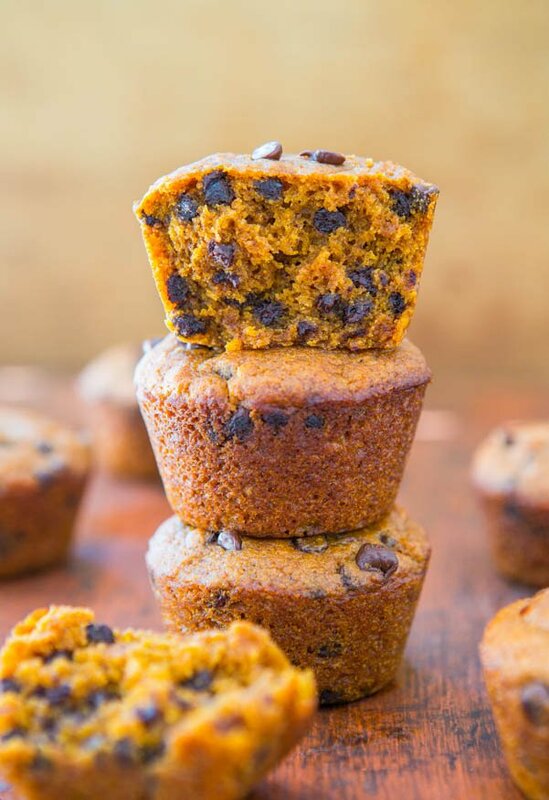 Vegan Chocolate Chip Pumpkin Muffins – You’ll never miss the eggs or butter! 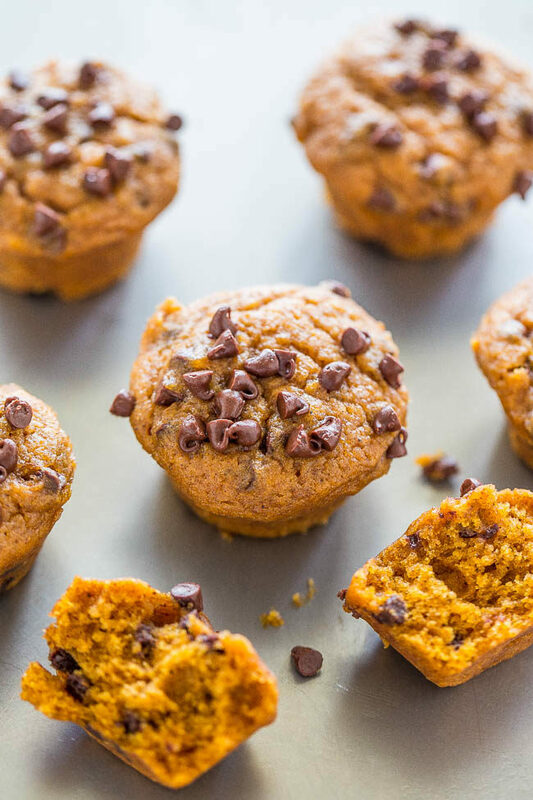 Easy, soft, fluffy and the best pumpkin muffins ever! 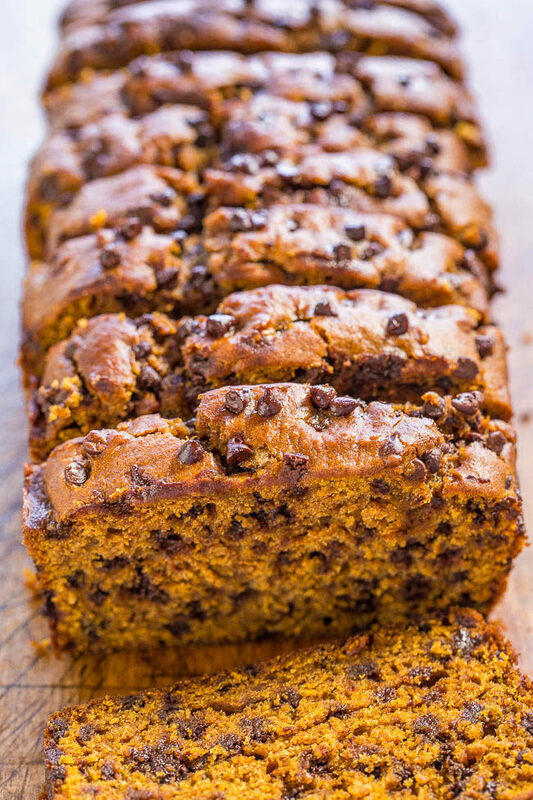 The Best Pumpkin Chocolate Chip Cake with Chocolate Ganache – One of my all-time favorite cakes, EVER! This is a must-make that everyone loves! 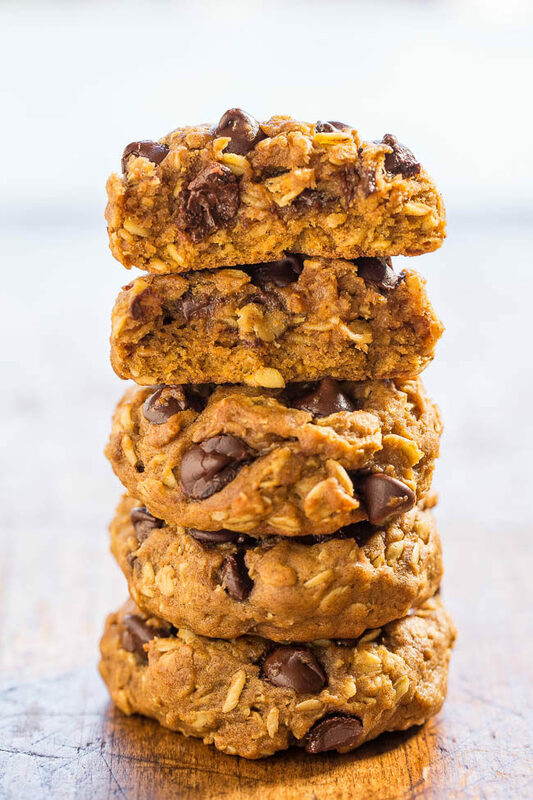 Soft and Chewy Pumpkin Oatmeal Chocolate Chip Cookies – A thick, hearty oatmeal cookie and a soft, chewy pumpkin cookie all in one! 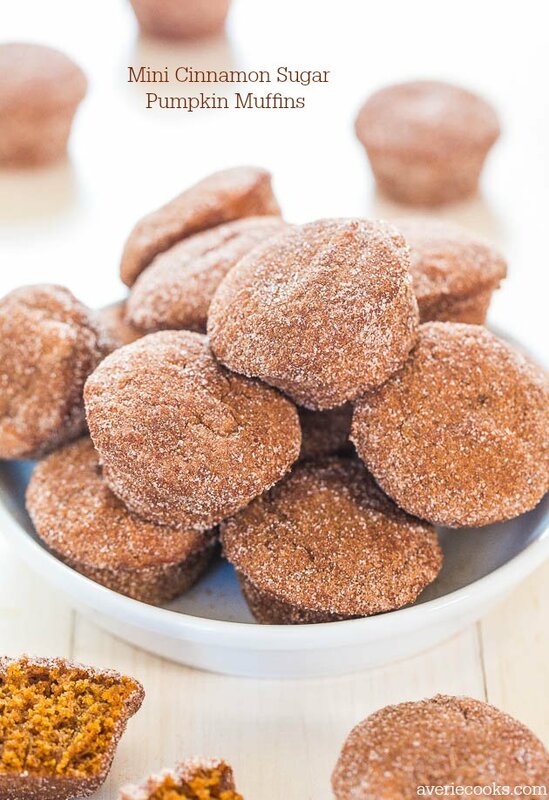 Lots of chocolate, not at all cakey, easy, and your new favorite pumpkin cookie recipe! 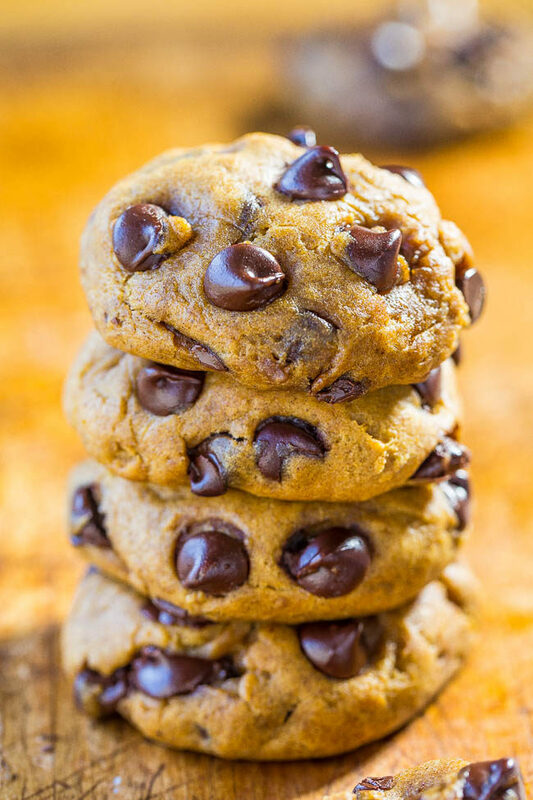 Soft and Chewy Pumpkin Chocolate Chip Cookies – No cakey cookies here! 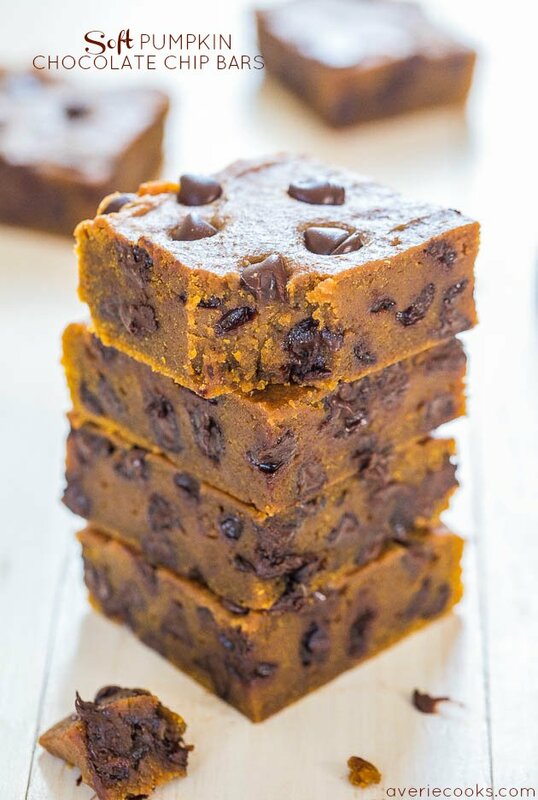 Soft, chewy, thick, loaded with chocolate and bold pumpkin flavor! Your new favorite pumpkin cookies! This does have a lot going for it and looks creamy (and luscious )! I like desserts with cream cheese and pudding–the texture isn’t as dense as cheesecake yet the pudding gets a little more “oomph”. I loved that this was light and didn’t have the heaviness of a cheesecake. Like seriously had to donate most of it or I would have eaten most of it! I have never heard of a Lush, but this sounds like something my mom used to make., but lemon like your moms. Must be a midwest thing? I have never made a lush before, but I need to! This looks so delicious! Maybe a Minnesota specialty? It does have a midwest vibe, but I’ve also never heard of a lush. 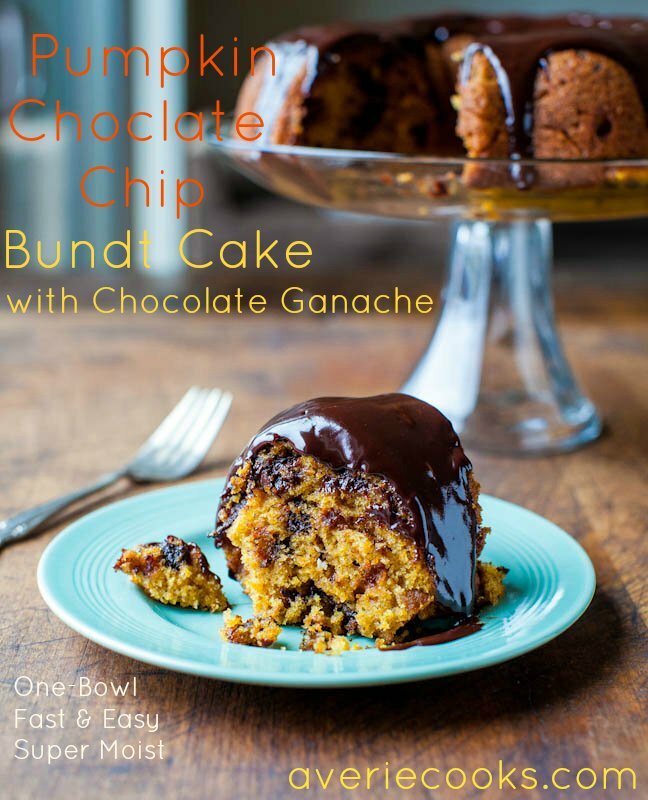 I would be tempted to double the recipe–it would be a great potluck dessert! Ok well I do have another California/blogger friend who makes lushes so I know they do exist outside of the midwest but yes they’re totally a potluck special. It’s really light and fluffy so a 9×13 pan would go fast! 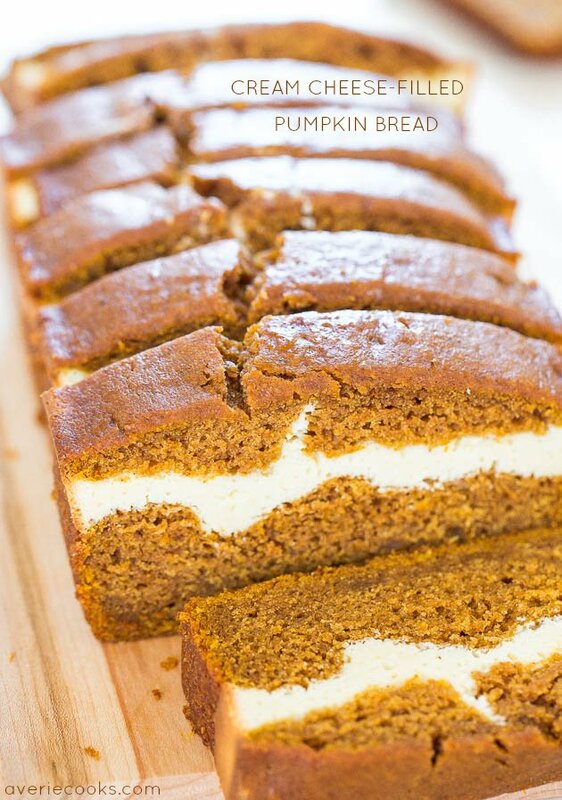 I can eat anything with pumpkin this time of year! I make a similar Lush, but I layer with chocolate graham crackers, and it disappears fast! I love that make lush desserts. A few people have said they’ve never tried them but glad I’m not the only one! I don’t usually comment on recipes until after I’ve tried them, but was fascinated by the “area of the country” discussion. I’m a southerner, originally Arkansas, and have been making and loving lemon lush since 1973. Recipe was given to me by a lovely 70 plus year old southern lady at that time. Your Pumpkin Lush sounds delicious. I’ve saved it and am planning on giving it a whirl a little closer to Thanksgiving. I love that you’ve been making lemon lush since 1973 and know exactly what it is! I love food origin/places discussions, too! Hope you enjoy this one and LMK if you try it! I never heard of a lush, but this sounds amazing! I feel like our get-together was way too long ago already! And so glad you got to try this! The lemon lush, such a good memory for me because it’s one of my mom’s go-to’s! 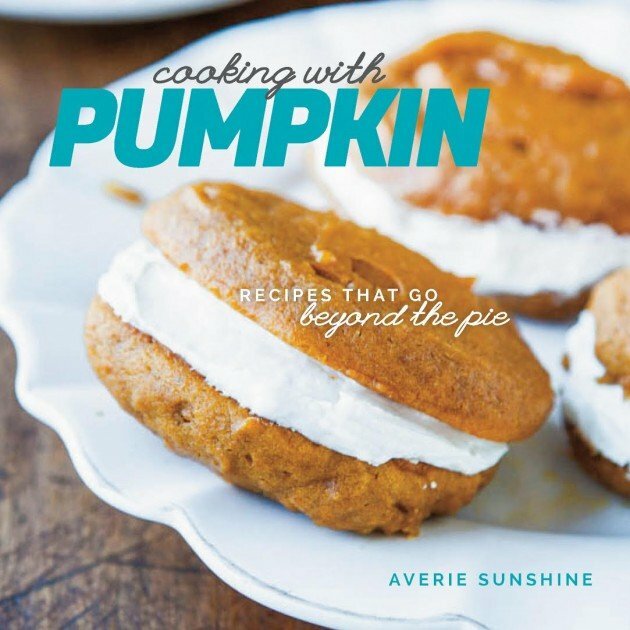 Averie would it be possible for someone to make a “frozen kind” pumpkin whoopie pie ? You could probably freeze this to the point of nearly frozen but still scoop-able so you can eat it in a very chilled state. Would it work out well if I did doubke the recipe? Used a 9 x13 plan? I haven’t personally done that but I’m sure you would be to double and make in a 9×13. Hi, Avery. I have made other recipes that you have posted and never been disappointed. I was going to make your pumpkin lush cake for a co-worker’s birthday with my preschool class and surprise her with it. There’s just one thing. She doesn’t like chocolate. Is there something I can replace for the chocolate chips? Would butterscotch chips work or would you have another suggestion? 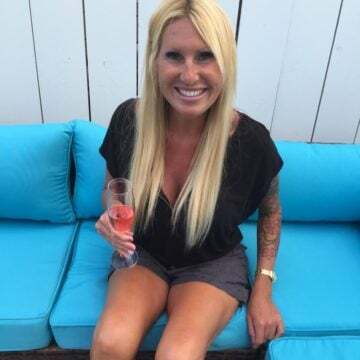 Thanks for the compliments on my recipes! I think butterscotch would be a great substitute or not sure if white chocolate is still chocolate to her, but that would be nice as well. Sometimes around this time of year you can even find pumpkin-spice chips too. But your first thought of just doing butterscotch is easy. LMK how she likes it! Did you have any issues with the chocolate and toffee chips sinking after leaving it in the fridge overnight? Would it be better to sprinkle these on right before serving? also- wondering what will happen if i don’t line the pan with foil. will this stick really bad? can i just spray with a nonstick spray? Use the foil, you’ll be happier later when it’s not making a huge mess. And I don’t have any issues with sogginess but you could always sprinkle on later if you’re concerned. I made this for a company potluck. it was a huge hit! I struggled spreading the cream cheese layer on the graham cracker crust so i just ended up mixing those layers together and spreading them out which was much easier. It tasted fantastic and i was asked several times for the recipe. I will definitely be making this again. Glad it was a huge hit and that you will definitely make it again! Can this be made ahead of time and frozen?? I am due any day now but am bringing this for Thanksgiving. Don’t want to be stuck in the hospital having a baby and not be able to make it the day before. I would say make in advance if it’s the choice of having it or not, based on your baby. Obviously fresher is always best but do what’s practical here. Congrats!! Is it safe to eat the raw puree?